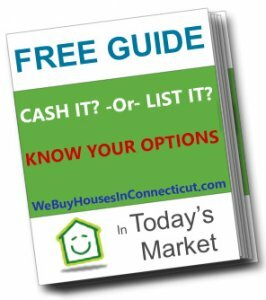 Sell Your Vacant House In Connecticut! Free Guide: Do I Sell My Vacant House Fast For Cash Or List It With An Agent?! You have a vacant house and it is costing you money every month! Maybe it needs significant repairs to either sell it or rent it out. Maybe you are tired of spending money on a house that tenants will neglect and destroy. Either way a vacant house is a liability. It is costing you money every month. Insurance, upkeep, lawn care, and even just the potential of code violations and vandalism, makes it a liability you just do not think is worth to have. Sell your house! Why not turn that money pit and liability into fast cash. You have options. Either list it with an agent (if you do not mind repairs and waiting for the house to sell if it indeed does sell) or sell it to a cash investor (if they offer you a respectable amount you are willing to accept for the house). The decision between listing it or selling it for cash is not as simple as you may think. People often do not understand how cash buyers work, nor do they understand the true costs of listing it with an agent. It is not just agent commissions you have to pay for, that deducts from your net profits. What people do not realize is that holding costs while the property sits on the market is truly the significant part of the cost and that all digs into the net profits. You are not alone with making this decision. We have put together a guide that will walk you step by step how to make the best possible decision in your situation. This guide can be found here. Download the Free Guide by entering your information to the right. We’ll email you the pdf of the guide so you can go through it at your own leisure. You’ll also receive other tips and help from our Foreclosure Avoidance team to help you make a well informed decision.